Chow Chow puppies will make a loyal and devoted pet, providing that sufficient time and commitment is given to training. 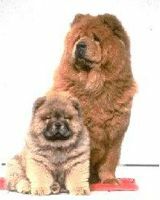 Often likened more to cats than dogs, Chow Chow puppies can be aloof and are independent dogs. While they have adorable, huggable coats, they are not overly thrilled with being cuddled. An excellent guard dog, even Chow Chow puppies are suspicious of new people and animals, but they are usually good with other household pets and children of the family. 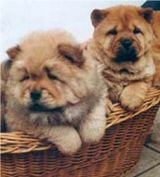 It is thought that the first Chow Chows were bread in ancient Mongolia for both their guarding abilities and their meat. Chow Chows have very unusual blue-ish tongues - folk lore has it that when God was creating the world, he spilled some blue paint while painting the sky - a Chow Chow licked it up and to this day has a blue tongue! Chow Chow puppies have a tendency toward stubborn behaviour and a lack of desire to please their owner - training is critical with this breed. Any failings now will be paid for as he progresses to his 'teenage' rebellious years!